Do you have a vacant lot nearby needing some beauty? Have you wanted to put a flower garden in one of those lots but have been afraid of being arrested? Would you like to do some random acts of beauty as you pass by an unkempt lawn? The seed bombs can be tossed into any bare patch of dirt. 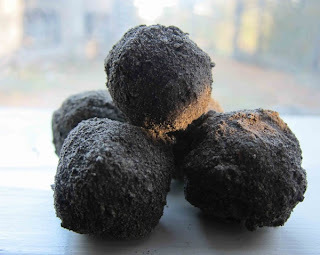 Seed bombs can be planted in the space around city trees, on roofs, in pots or even cracks in the pavement. Just toss the seed bomb onto any patch of dirt, and when it rains, the seeds will spout - creating a spot of beauty! Make your own seed bombs and give them to your friends and family. It only takes a couple of minutes to make. NOTE: The clay is used to protect the seeds from insects, birds, etc. who might eat them. If clay isn't available in your area, you can use Crayola Air Dry Clay and is found in Amazon or Walmart. Mix the clay and compost, adding just enough water to make it hold together (Similar to play dough). Place a few seeds in the middle and roll into a small firm ball. Dry for a couple of hours. The seed bombs shouldn't break open. In fact, they should stay relatively intact even after they have been wet by rain a few times. This way the seeds stay protected and moist. When the seeds germinate, they will break through the clay. The seeds don't need water right away. They will stay dormant until rain comes. If the seeds are the right for the area, then they will do fine. Of course, not every single seed will sprout. Cindy Weining Waller posted: JUST make sure you are not introducing a plant which will destroy the natural ecosystem. Remember seeds travel. Bufflegrass is an invading seed fueling most Arizona fires and chokes out the native grasses. Kristin Davis posted: Has anyone here used these? I'd love pics. I'm trying to grasp how many flowers and over what span of area each ball would give you (theoretically, I know it would depend on how many seeds you put in), but maybe just a general idea. I think they would make great Christmas gifts or Mother's Day gifts. Stacy Jay posted: Obviously you would need to use seeds not needing a lot of care for your area once they start growing. Should plant veggie seed bombs for areas of poverty. But once again, would need care and water.